The current issue of National Geographic was designed around a central theme: the fact that for more than a century the popular magazine has failed in its coverage of people of color and was at times openly racist in portrayals of non-white cultures. University of Virginia historian John Edwin Mason, who studies the intersection of photography and African-American history, reviewed the magazine’s archives. Mason told NPR that in his review, a hierarchy emerged. “And that hierarchy was very clear, in the writing and the photography, that the West, and especially the English-speaking world, was at the top of the hierarchy, and black and brown people were somewhere underneath,” he said. Mason also found that the magazine all but ignored people of color in the U.S. until the 1970s. In a letter to readers in the race issue, Susan Goldberg, National Geographic’s first female editor-in-chief and first Jewish editor-in-chief, announced the magazine will be taking on the issue of race over the next year. Granted, this work is still being done by a largely white staff, but Goldberg said the magazine is hoping to take on this issue as well. “If you’re going to continue to adopt a journalistic stance that’s predicated on objectivity, then you’re not going to be able to recognize the ways in which your coverage is still problematic,” Candis Callison, associate professor at The University of British Columbia’s Graduate School of Journalism, said on a recent episode of the “Media Indigena” podcast. A newsroom can claim it wants to be objective, in other words, but if that newsroom is overwhelmingly white, chances are it still lacks a deeper understanding of any community of color it attempts to cover. 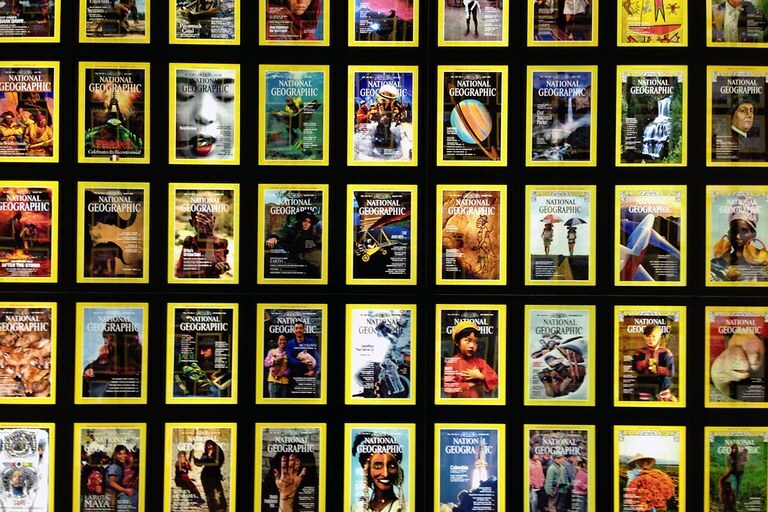 A collection of National Geographic's covers displayed on a wall in the National Geographic Museum. “(National Geographic) called their reporters ‘explorers’ for heaven’s sake,” Kim Tallbear, associate professor of Native Studies at the University of Alberta, said on the podcast, noting how nakedly the magazine has incorporated othering. National Geographic’s opening issue on race had no stories on Indigenous peoples. In an online piece explaining the issue and the magazine’s promise of more coverage of race and identity, Debra Adams Simmons, the magazine’s executive editor for culture, made the sole reference to Native Americans. That isn’t to say there are not writers at those organizations who cover Indigenous issues very well or that they do not offer work to Native reporters. Julie Turkewitz, who was recently promoted to the Times’ national desk, has consistently done thoughtful work from Indian Country, even giving Native writers their own platform to talk about Thanksgiving. The Times’ coverage of an Indigenous roller derby team was also very well done. The depth and insight of NPR’s Code Switch team on a variety of race and identity issues, including Indigenous, is consistently impressive. And NPR recently produced a series on Native American discrimination, which I contributed to. National Geographic’s admission and the current issue (problematic as it may be) is a step in the right direction. I’m encouraged to see that other national outlets are making efforts to better cover Indian Country, giving more thought to representation and historical context. My job as contributing editor on High Country News’ tribal affairs desk, perhaps one of the only such desks at a non-Native publication, is one example. One of our goals on the desk is to employ and empower Indigenous writers and editors. To that end, I’m happy to announce that in mid-June, Tristan Ahtone, a citizen of the Kiowa Tribe and a contributing editor on our team, will be signing on full-time to lead our tribal affairs coverage as an associate editor for High Country News. We’re excited to add his dedication to nuanced, high-quality coverage of Indigenous issues to the desk. There’s no doubt that Ahtone’s upbringing as a member of the Kiowa Tribe plays an important role in his ability to cover these issues. And that’s why newsrooms need to diversify, not for the sake of “diversity” itself, but to better reflect our changing society, for the betterment of all.